Before I opened the big green package I didn't even know that there are other products from Himalaya Herbals that are available here in Indonesia other than face washes. Apparently they also have other variants of products such as face moisturizer, lip balms, baby products, and even toothpaste! As you can see above, I received a variety of products such as face wash, face mask, moisturizer, lip balms, etc. 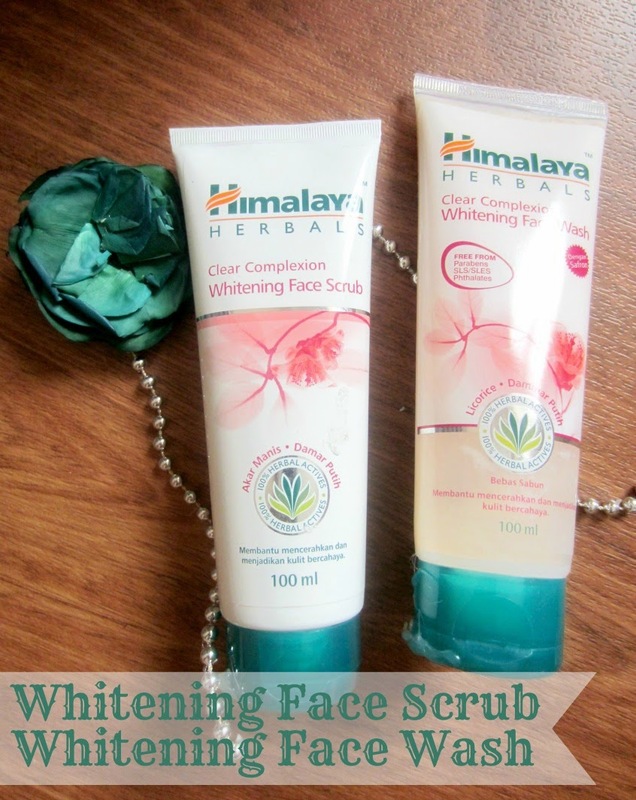 I have reviewed two variants of Himalaya Herbals before which is the Purifying Neem Face Wash and the Gentle Exfoliating Daily Face Wash (you can read the review here). Today I will review a series of products from their Clear Complexion variant. 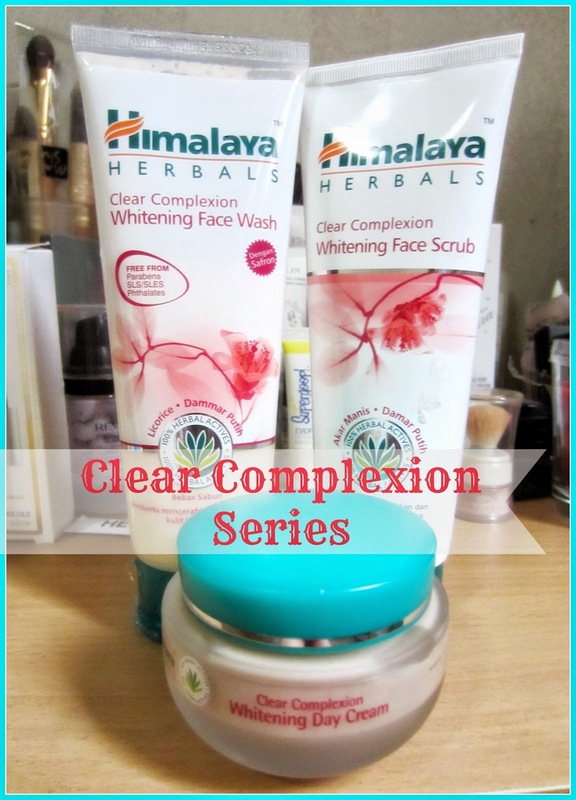 The Clear Complexion is the whitening range from Himalaya Herbals. The range was created to give a result of clearer and more visibly brighter skin. There are three products in this range which are: Clear Complexion Whitening Face Wash, Clear Complexion Whitening Face Scrub, and Clear Complexion Whitening Day Cream. I've been using this range for over two weeks now and I found it works great with my normal-combination skin. I think this is pretty much suitable for any skin type but if you have sensitive skin you still have to try it on small patches first to see if your skin has any reaction to it or not. The main ingredients in this range is Licorice extract and White Dammer Bark extract (damar putih). Licorice root extract helps regulate melanin synthesis to restore our skin's natural fairness, while white dammer bark extract has a clarifying and brightening properties. When I changed my daily face wash with this one I felt that it balances my combination skin. So it keeps my skin from being too oily or too dry. The texture is a clear-like gel which goes on light on the skin and did not irritate my skin at all. It has a soap-free formula and free from paraben, sls, and phtalates. Overall, it's a nice no-fuss face wash that I can use everyday to clean my face. Lastly, I used this cream as my morning moisturizer after washing and scrubbing my face. This medium sized pot is full with yummy looking cream filled to the brim! It is a light and non-greasy cream that sinks in nicely on my skin without leaving any residue on the surface. It suppose to helps clear dark spots and uneven pigmentation on the skin, and it has natural UV protection too. The moisturizer has a pale brown shade with creamy consistency that feels luxurious on the skin. Overall, after using all three products as a range of skincare for a couple of weeks, I feel that my skin loves it and they keep my normal-combination skin feels more balanced. I also didn't experienced any breakout or irritation. Out of all three products, my favorite would be the Whitening Day Cream because of the creamy consistency and I also love how my skin absorbs it really well. The nice packaging is a bonus! Himalaya is a great brand and their product are always trustworthy, but a complete package is really a great thing. Congrats. Why my face is getting darker after using clear complexion whitening cream??? Is the skin whitening claim really true? Did anyone find any changes?? kak, kalau review produk gini gimana himalaya milihnya? apa org yg ngajuin diri buat review produk atau himalaya yg nyari?